Hi there, folks. 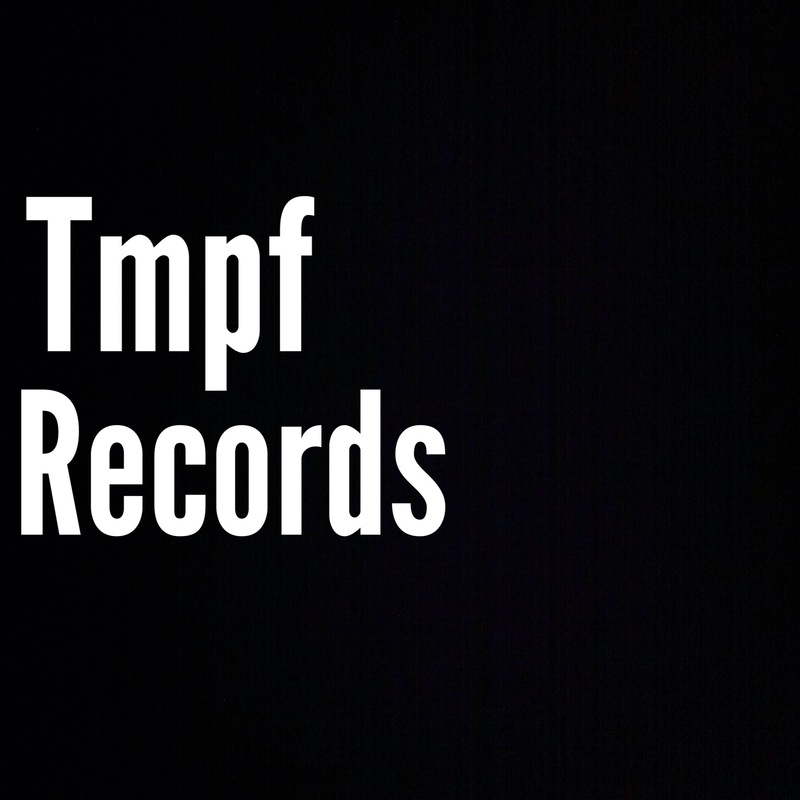 I just want to share a track from my upcoming album with you soon to be released on Tmpf Records. I don’t have a release date just yet, but it will probably be sometime in Dec. Anyway, here is Hat-trick #8. It’s based on the same ‘spontaneous composition’ technique used on the Fortunes and Hat-Tricks, Vol. 1 album. I do hope you enjoy. I’ll keep you posted on when the full album is available to hear and to have! If you’ve ever been on a crowded subway car you know that things usually goes one of two ways. The first and most likely scenario is that most everyone seems to take the crowd as a personal affront, and they aggressively assert themselves. They tend to obnoxiously claim as much space for themselves as possible, totally disregarding everyone around them, ignoring the fact that they are all going through the exact same thing. This approach makes the experience more difficult for everyone. Truly no one wins. The second way things can go is that most of the people on this crowded train car realize they are not the only ones experiencing this, and they work together leaving as much free space for others as possible, treating those around them with respect and humanity. They take off bulky back packs and put them on their laps or between their legs. They hold the pole so others can too, instead of leaning on it, leaving room for no one else. Metaphorically apply the first approach to handling the subway situation to a jazz ensemble freely improvising. Most times free improv = every-man-for-himself type of mayhem. Each musician is so concerned he won’t have space of his own that he never leaves any space for anyone else. Even if what each individual player is doing has musical merit, if no one is listening to anyone else or willing to leave space, the result is unmusical, the result is cacophony. For the audience the result is, almost without exception, an aggressive and exhausting aural attack. The audience is excluded from the performance, and honestly, so are all of the players. Now imagine the second approach to the crowded subway conundrum applied to free improv, and that’s what you get with Fortunes and Hat-tricks, Vol. 1. 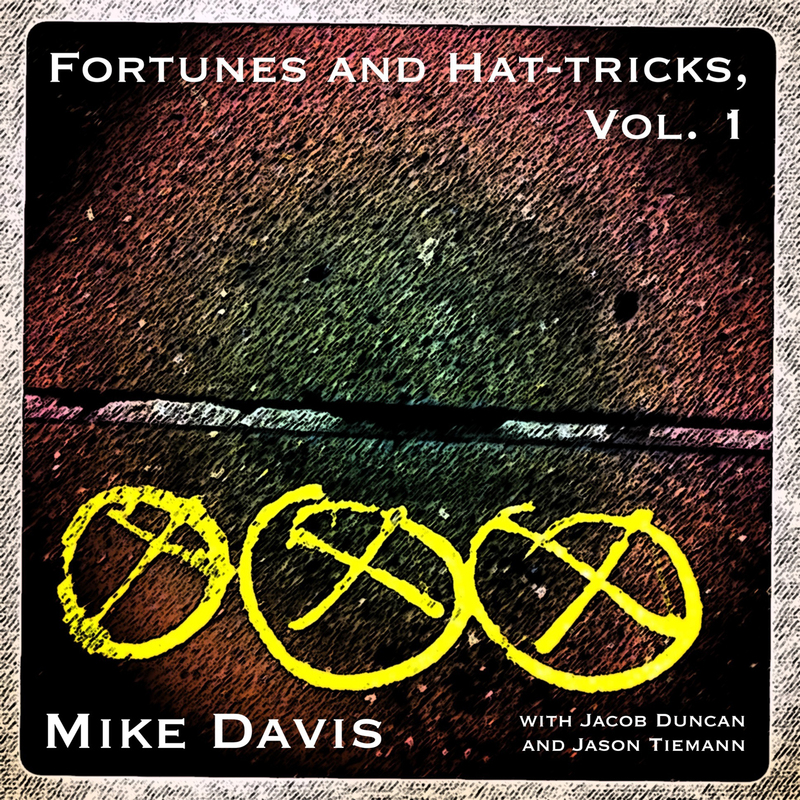 On this album, Davis, Duncan and Tiemann cooperate in the truest sense of the word. Here you have three musicians who are acutely aware of the space they occupy…constantly listening to each other, looking at each other, respecting each other. In the end what you are left with is an improvised work that, though completely unplanned, has all the most important elements of composition – direction, focus, melody, development, dynamics, contour, space. Utilizing this rather selfless approach to improvisation, everyone is serving the music and the spirit of the moment and the ensemble…and the reason for doing this in the first place. It is near impossible to believe the first track, Good Sense Is the Master of Human Life, is the one and only take of a completely unplanned song. So strong is the conviction of each player, so quick is each player’s ability to recognize his role and refine his approach, that the listener is positive there is at least a lead sheet or a sketched theme. Surely there were rehearsals. Surely there was discussion of vibe or cues at least. Not so – nothing of the sort in fact. Track 2, the pensive and well-crafted The One You Admire Would Welcome a Gift, like all the other pieces on this album, had never even had its title uttered before the tape began to roll. Even a rambunctious explosion of a song like It Is a Silly Fish That Is Caught Twice With the Same Bait, as busy as it is, has a kind of clarity that only comes from a uniquely deep level of musical coexistence. The three improvisers work as one composer – defining and refining roles, themes and abstractions, while simultaneously leading and submitting, creating canvas and paint and piece all in a moment. Other highlights include the dreamy and at times eery Someone Dreams of Being With You and the abstract yet playful Hat-trick #9. Below is from today’s “Take Five With…” article in All About Jazz. I took a few minutes a while back to answer some questions, and this article is the result. I’m leaving off the Bio stuff from the top of the piece. Enjoy! I knew I wanted to be a musician immediately upon touching the bass for the first time. I had been an avid record collector as a child, interested in many different styles of music. A friend in high school played bass and I borrowed his sometime around 1986. Immediate reaction! I began taking lessons from David Foster (currently the bassist for Airmen of Note) and he really helped guide me to my first great jazz records. Now He Sings, Now He Sobs, by Chick Corea, was the first jazz record that made me need to play. It blew my mind. I knew I was a musician immediately. It felt right and I’ve never looked back. For me, music has to evoke a feeling or an image. I have long loved jazz but I have long loathed musical athleticism to no expressive end. Whether playing standards, improvising freely, or interpreting new original material, I believe a mature jazz musician/ensemble uses technique to serve the concept and the vibe- not to show off. When writing I think exactly the same way. I seek to tell a story rather than to create a vehicle on which to blow. The blowing should serve the song and its story in my opinion, not the other way around. To be honest, I have recorded with my dream band. I can’t think of people better on their instruments and more giving as improvisers and ensemble players than saxophonist Jacob Duncan, guitarists Tim Miller and Niclas Höglind, along with drummers Norm Bergeron and Jason Tiemann. That said, I have always dreamed of playing with Keith Jarrett. Also, I’d love to work with Dave Douglas, Ralph Towner, Bobo Stenson and Jon Christensen. In the summer of 1991, just one month shy of my 19th birthday I was playing with a big band at the Montreux Jazz Festival. It was my first time out of the country, I was young, excited, and ready for adventure. The evening before we were to return to the states, I went skinny dipping in Lake Leman with a few of the guys from the band and some girls we met. Like the 18 year-old numbskull I was, I left my passport in the pocket of my shorts on the beach. Naturally, it was stolen! The next day, I sent my bass with the band to the airport while I worked like a maniac in Geneva filing police reports, visiting the consulate to tell my tale, and having new passport photo taken. I got it done and made it to the airport with only moments to spare. Lessons learned: 1. It would be nice to know at least a little French when in Geneva; and 2. Don’t go skinny dipping if you have your passport with you…just don’t. 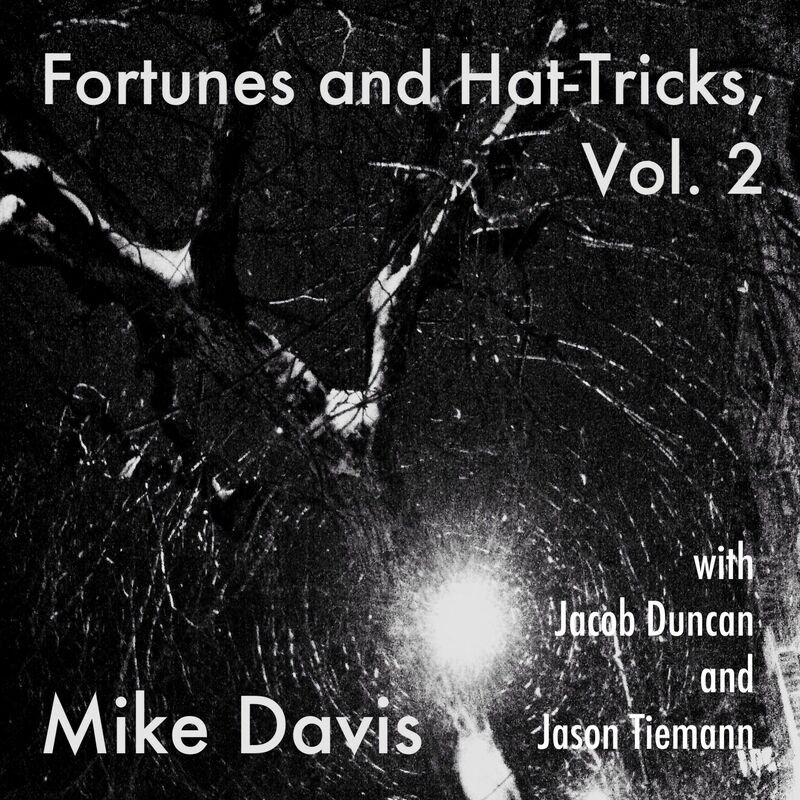 Without question, my favorite recording in my discography is Fortunes and Hat-tricks, Vol. 1. It was 100% spontaneously composed by the ensemble and I feel it is a total success musically. We didn’t rehearse, we didn’t discuss, and we didn’t listen back to a single take in the studio. In each moment we fully committed to the results and the end result was a very pure abstraction conveying the essence of each song title or set of prompts with great empathy and intuition. I am very proud of it. The first jazz album I bought was Chick Corea’s Now He Sings, Now He Sobs. It absolutely blew me away. For a while I listened but had no idea what I was hearing. Later on, I performed a show in Houston with a trio including Bruce Dudley and Todd Harrison playing all the music in order from the original release. Very fun, very challenging, and totally humbling. I believe the most important thing I am contributing to the world is music with an unselfconscious blending of the lyrical and the abstract. By not feeling the need to fit neatly into a particular sub-genre of jazz or even always into the genre of jazz itself, I believe I’m making music that challenges listeners without excluding or disregarding them. Echo and the Bunnymen, Ocean Rain (Korova). I think jazz today is having a major identity crisis. There are some truly great artists but in this current hyper-marketed world (more than ever before) everything is a product, including art. Everything has to have a tweet angle, a Facebook Fan Page, a spinable look and vibe, etc. Edge is fine as long as it’s part of the marketing strategy. Requisite hipness is making it hard for folks to listen to their instincts and make real art. There are also very few listeners whose ears haven’t been so impacted by current popular music lacking in dynamics, totally pitch-corrected, metronomically steady tempo, drum sounds replaced to avoid any variation, and lead vocals looped from chorus to chorus. Humanity is being drained from popular music and jazz is all about humanity. Fewer and fewer listeners have the patience for jazz. It’s more important than ever to do everything possible to reach people who might love jazz, who might love musical risks, and who might love real spontaneity. If only they just heard it. I think in order to keep jazz alive and growing we need to share it with kids. It needs to be a basic part of an education as an important aspect of American history and culture. It shouldn’t just be taught to kids who might want to play. Jazz already tends to be played, first and foremost, for an audience of players. It’s what makes it feel so exclusive. I think any cultured fan of art in general given an appropriate amount of exposure to jazz at an early age, could appreciate the tradition, the purity of expression, the near psychic level of communication, and cooperation between members of a group when they’re really listening, mature, evolved, and trusting. Honestly, there needs to be a significant movement of jazz artists taking themselves seriously as composers of concert music. The pieces and the concepts behind them need to become as important, memorable, and worthy as the ensuing improvisations. I am currently working on several projects as a leader. One is a piano-less quartet album of deconstructed standards. The “new compositions” use the original pieces as starting points employing a variety of compositional techniques. Another project, admittedly epic in scope, is a musical interpretation of Kurt Vonnegut’s novel The Sirens of Titan. The project, called Universal Will To Become, is expected to be nine volumes/albums long. The song titles are evocative phrases from the novel itself. The writing techniques are extremely varied. The goal, esoteric to be sure, is to instrumentally explore the novel’s “big questions.” As producer and bassist, I am working on a trio album with Dallas-based pianist Brad Williams wherein we try to reinvent exceptional pop and rock songs by the likes of Band of Horses and Björk. What is your favorite song to whistle or sing in the shower? I catch myself whistling “Blue Monk” way too much. I run a dog walking service in Manhattan. This is an album featuring me on double bass, Jacob Duncan on Alto Sax and Jason Tiemann on drums. All songs were spontaneously composed by the trio. There were 2 compositional concepts employed. The first I call Fortunes. I have collected 100’s of fortunes from fortune cookies over many years. Each member is given a small pile of them. We take turns drawing them. The ‘player’ who draws a fortune reads it aloud and then begins the piece. There is no discussion whatsoever about style, tempo, key, mood. We just use the fortune as a jumping off point and as an evocative title. We listen to each other for the development of themes. Truly the only rules are to listen and compose. I use the word ‘compose’ to suggest that we are not just improvising aimlessly on our instruments, but that we are open to discovering and playing a specific role within each spontaneous composition in order to instrumentally evoke the feeling of the title. Whether we are successful is totally subjective. FYI, we never listened back to anything in the studio. There was no point. Each title is discarded forever once performed live or in the studio. The second concept employed I call Hat-Tricks. Each player writes some sort of brief instruction for another player on a slip of paper. The instruction can be abstract, musically specific, anything at all. Before each piece, each player draws a slip and reads the instruction to himself. The piece begins when each player agrees they understand their own instruction, but they do not discuss or reveal them to the others. The resulting piece is a collaborative effort where each player is bound only by his interpretation of the brief instruction he drew. Once again, the only rules are to listen and compose. Soon I should be sharing some press as well as some show dates. That’s next for sure, but meanwhile I hope you’ll go and check out the music available so far. 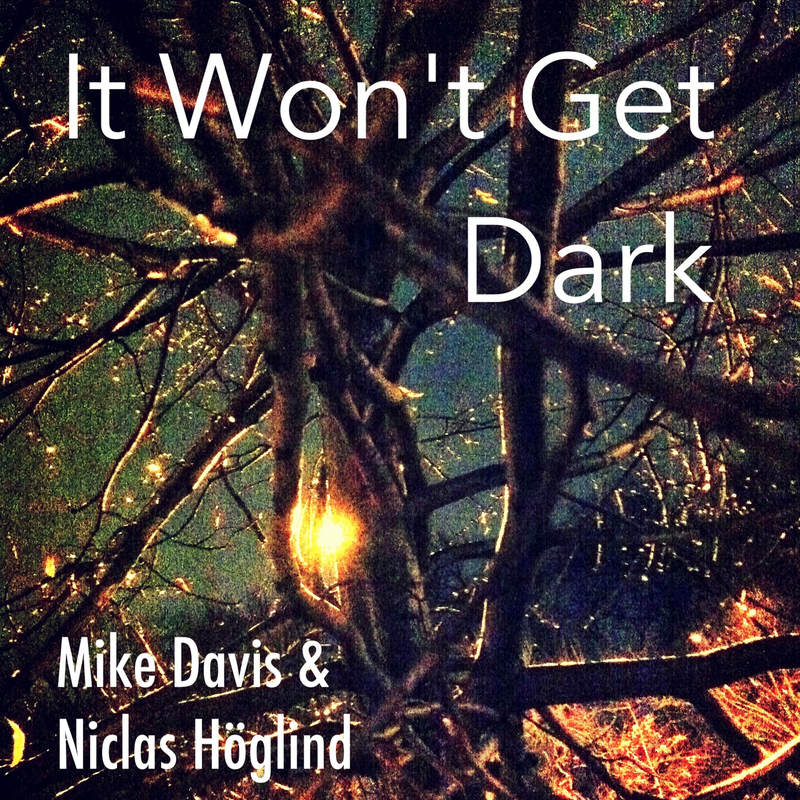 It Won’t Get Dark available for purchase! New record, I See Better With My Eyes Closed, out today! Hi everyone. 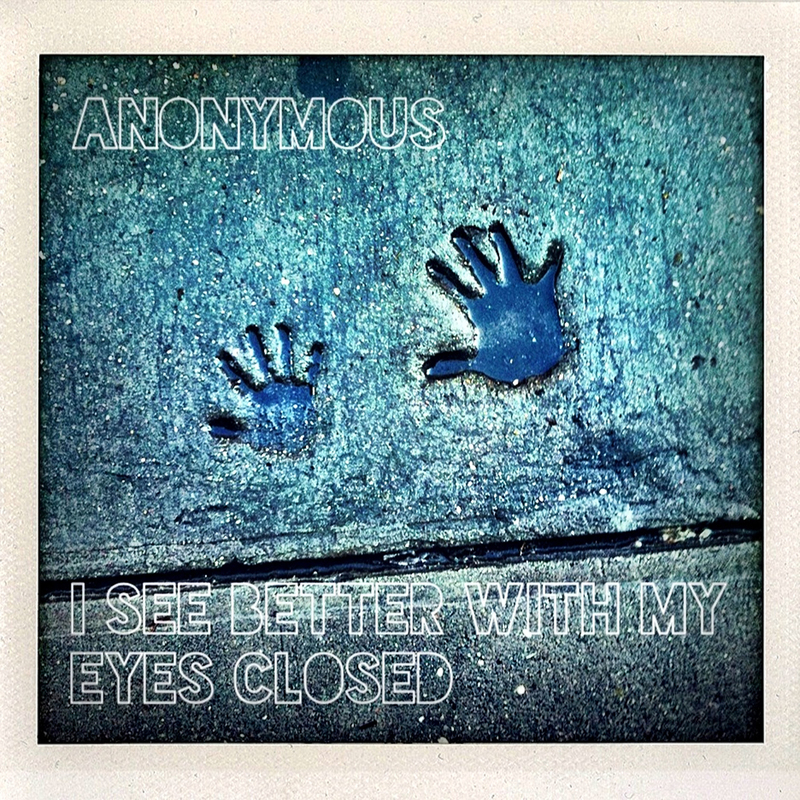 ‘I See Better With My Eyes Closed’ is now available for purchase at all online digital retailers. Click this link to hear Butterflies for No One. or go to iTunes, Amazon, eMusic, etc. You’ll love it, I promise!